This post will cover the Midsummer / Summer Solstice / Litha ritual and celebration held by the Circle of Fountains. 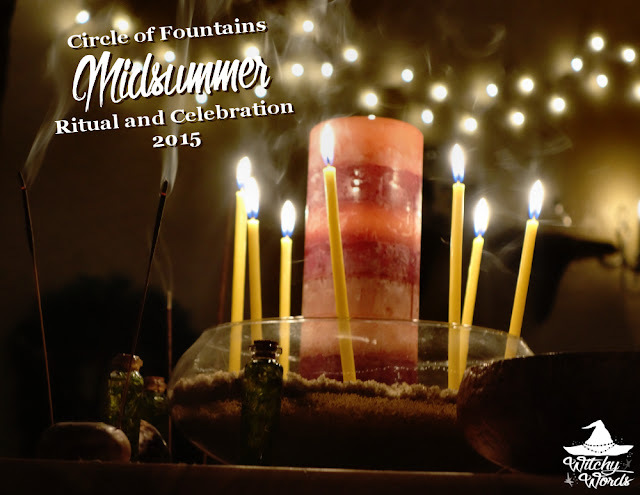 For Circle of Fountains 2014 Midsummer Ritual, click here! 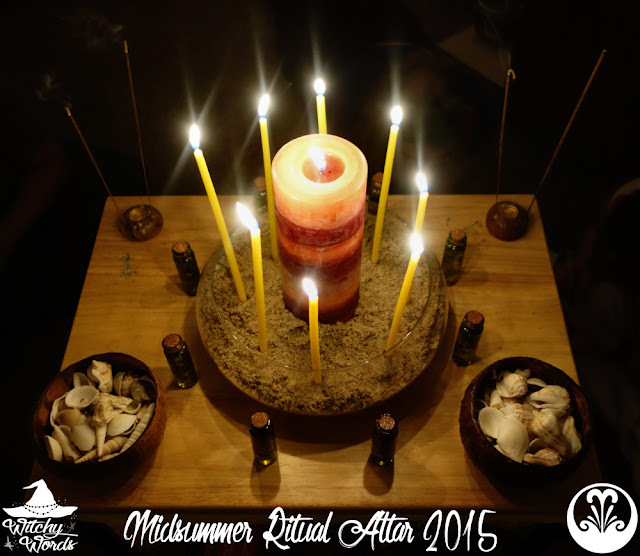 My personal Midsummer altar will be posted in the next few days! Ritual this year was hosted and written by myself. We had a bit of a hiccup as the person originally designated for the ritual had an emergency. I took it on last minute (written and prepped in three days!) to help the original member with their workload. Of course, I've been working 80-hour work weeks and apparently my health isn't stellar right now according to my blood work, so preparing for this ritual proved interesting. However, I think the circle enjoyed the ritual and hopefully you will too! I also have to give a friend of mine, Annie, a giant thank you for coming over an hour before ritual to help me clean and set up. I had to work the day of the celebration and my house has been in shambles because of how busy and ill I've been. Annie's help was an absolute blessing. I couldn't have done this without her! Our Midsummer celebration began by making Green Man Masks. Green Men are often depicted as masculine faces made entirely of leaves in art. For pagans and witches, the Green Man can be a representation of the Horned God, particularly during fruitful months. Our masks were made from simple, inexpensive plastic masks. I found a large floral vine for just under a dollar at a thrift store that provided leaves and roses. I also grabbed a package of moss at our local craft store to add some finishing touches. After the masks were completed, we sat down for dinner. Thank you so much to CF member Jessica for bringing a folding table that was big enough for everyone to dine on! 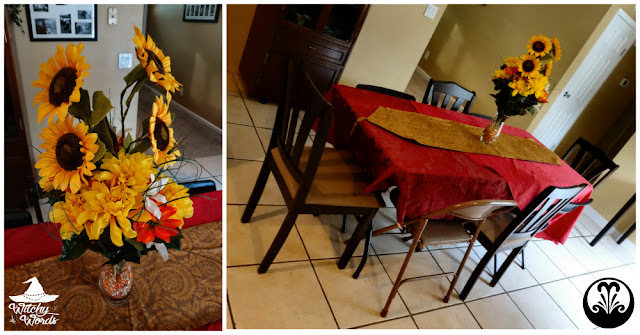 We have nine standard attendants each ritual and several guest members now, so ensuring we have enough space for everyone to eat dinner on is essential. Dinner itself was a potluck coordinated by CF member Kolika and contributed to by every member of the circle. We had quite a selection this sabbat! 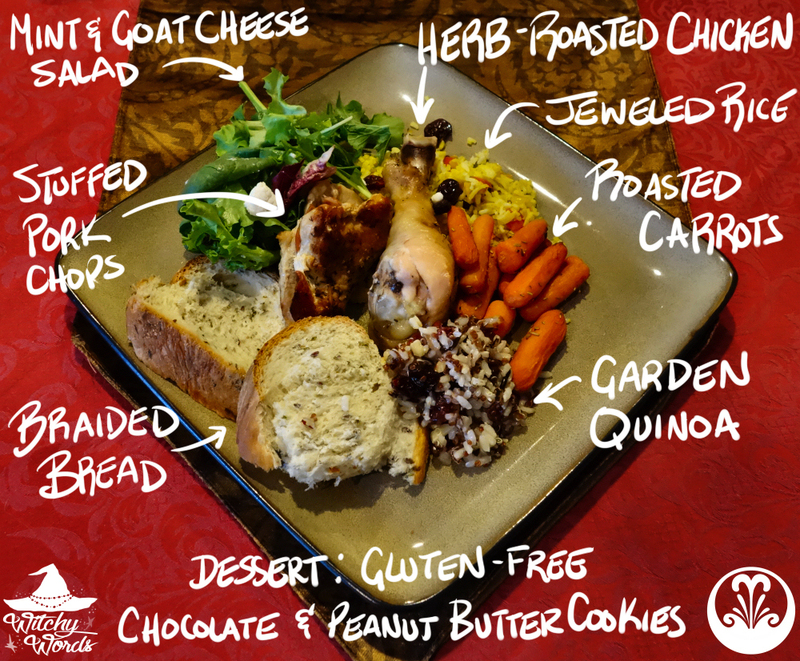 Take a look at all the foods we enjoyed above! After dinner, I used an owl lantern to lead us down to a dark circle room with a single candle lit. In the darkness, I read an introduction to Midsummer and its many meanings. I spoke of how the Summer Solstice is a time of life and dedication. In older times, the longest day would possibly symbolize the longest working day, a strong representation of dedication. This is a day many couples would choose to dedicate themselves to each other in marriage, and a day many pagans would choose to dedicate themselves to the craft. 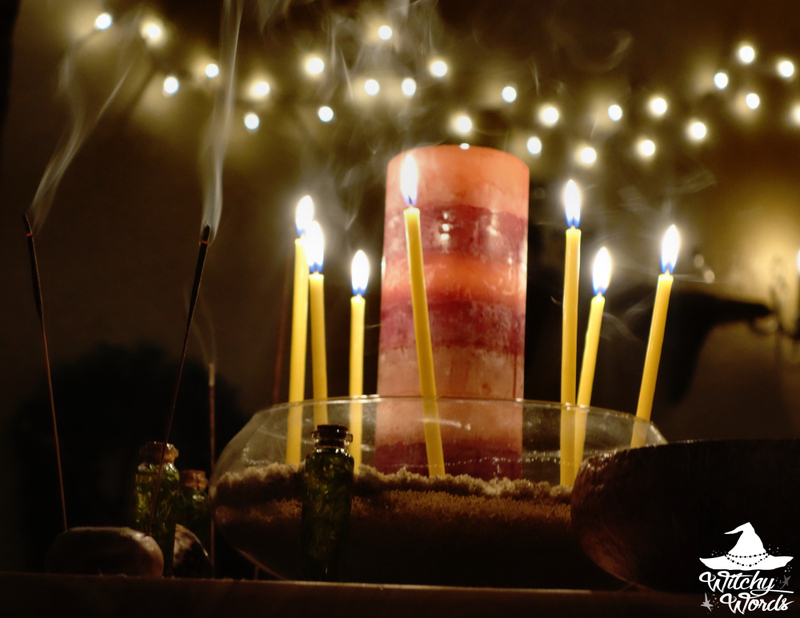 Because Litha is associated with fire, this is also a sabbat of protection and purification. And, of course, we honor the light and warmth of the sun. We began first by calling the quarters. We always have four people who are not leading the ritual volunteer for this. It makes it so much easier on the ritual leader, plus it unifies the circle's energy. It also gives the ritual leader a chance to plug in the lights around the circle once it's cast as a symbolic barrier. 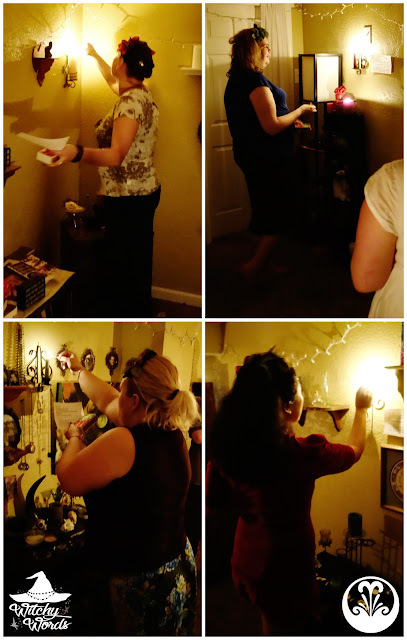 Because Circle of Fountains is a multi-faith circle with members of varying pagan denominations as well as witches alike, I also make it a point to ensure everyone can call upon an energy, spirit, ancestor or deity of their choice. 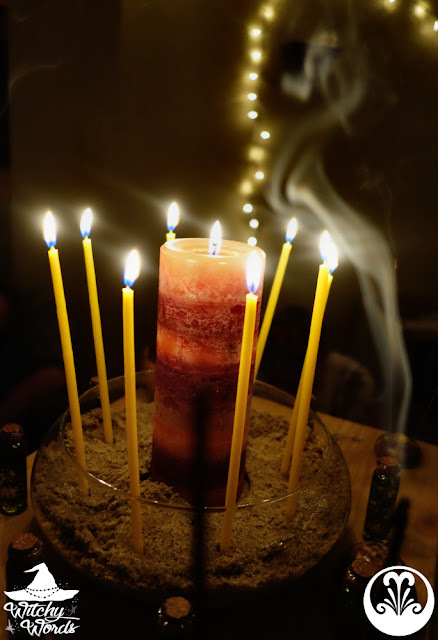 For this portion, members lit matches from the center, then lit sticks of lavender incense. Deities called upon included Gaia, Loki and Thor. I work more with spirits and ancestors, particularly as a non-theist, so I called upon my grandparents. I spent many summers with my grandparents until they passed, so they're most representative of Midsummer to me. We then began the dedication portion of the ritual. I found several sets of adorable thin willow tapers at our local craft store for just $1 for 12. How appropriate for dedication candles! Each member was asked to dedicate themselves to one person, place, thing or concept for the year. Some members chose to dedicate themselves to friends and family while others focused on jobs or health. Still yet, other members chose to use the dedication for themselves - either to love, discover or take better care of themselves. Once everyone had chosen one thing to dedicate themselves to, we used a candle to dedicate ourselves together to the circle. And it was positively amazing! The energy exuded by every member of the circle created the largest flame any of us had seen on a single candle! That's some dedication right there. This section completed the ritual altar. The dedication candles were placed in sand so that they could burn out without posing a fire risk. I feel sand is particularly relevant to Midsummer, as well. In fact, most of the ritual was either sunflower- or beach-themed, with yellow flowers, seashells, sand and coconut bowls everywhere. I couldn't be too far off, since one of the deities sent the symbol of a seahorse our way! I promise you that this photo was not edited to create the image. In fact, my husband practically blurted out "Seahorse!" during ritual. For the next part, we sat down to create sea shell protection amulets. Using circular translucent shell disks and cord of different colors, I passed around some potential symbols for use. Members could either create necklaces of protection for themselves, or use the amulet in their house, garden or car. Because of the translucent nature of the shell disks, these amulets would be perfect for catching the sun. They could even use it to protect their pets! In fact, that's exactly what I did. As I was creating my protection charm, my dog Artemis decided it was specifically for him. When I held it out to him, he licked the back of it once very determinedly, so I decided to tie it to his collar. He was so proud to wear it, and pranced about the rest of the night to make it cling with his tag! Artie was practically inseparable from me most of the night, especially once in ritual. He truly is my familiar! 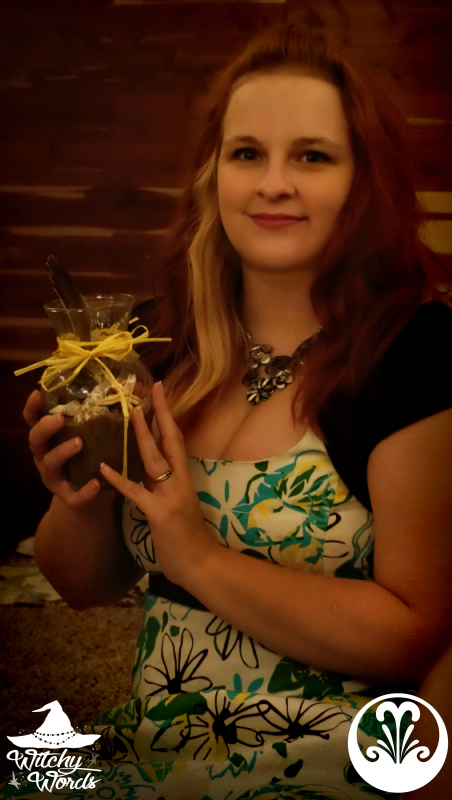 The next step of the ritual was to create "Litha in a Jar" mini-altars. This portion was inspired by a reader who asked if I would do other mini-altars in glasses or jars for other sabbats. If you were looking for one for Midsummer, here it is! For this altar, I decided to go with a beach theme. Doing this makes it less blatantly pagan for those of you still in the closet, but you're welcome to add on to it! I found the vases at the thrift store for between 0.50 cents and $1 a piece. We started with a base of sand purchased at a hardware store for $3, and then filled the rest of it with objects you'd find on the beach, such as starfish, seashells, moss, feathers and wood. I also stumbled across whole flowers and herbs, such as miniature sticks of cinnamon, whole dried jasmine, whole cloves and more. All of these items were heavily discounted. In fact, the jars of jasmine, cloves, cinnamon and whole orange blossoms were originally $8.99 discounted to $1.20. How lucky is that! Finally, many members chose to finish their jars off with a bow made of some various cord materials we had in the room. Click on the picture above for a larger image! To ensure they got home safely, I purchased plastic $1 sand pales for kids and gave them newspaper to stuff around their vases. 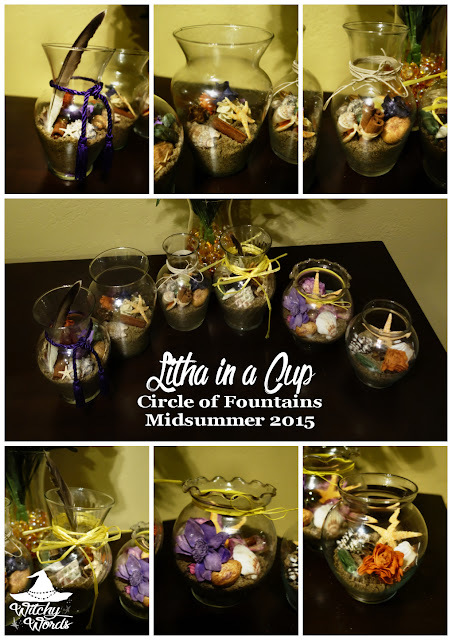 Everyone's Litha in a Cup altars made it home safe and sound! 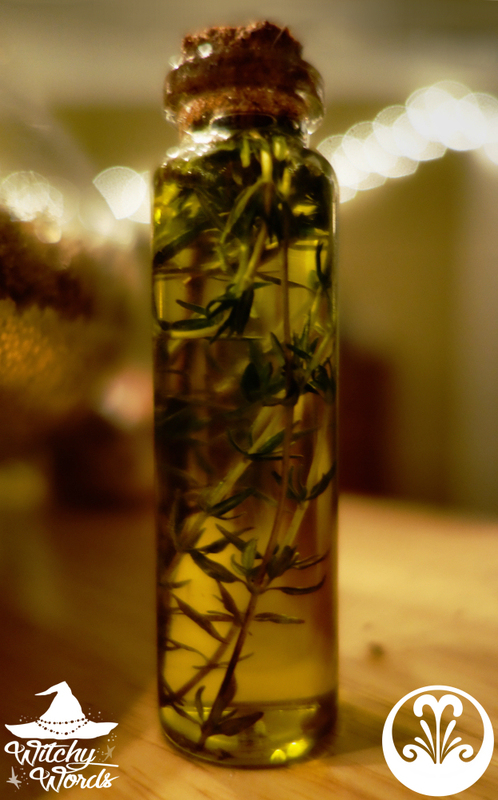 The final element of the ritual included small vials of thyme-infused olive oil. It is said that using a cotton swab to dab your eye lids with this mixture just before sunset on Midsummer will allow you to see fairies! 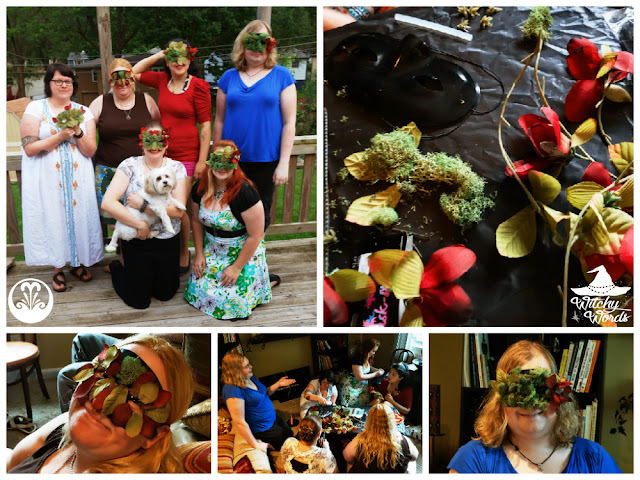 If you believe in the Fae, they can bestow you with gifts on Midsummer. However, a word of caution: Not all fairies like to be seen. As always, protect yourself and proceed gently. Just before closing the circle, I read a short nostalgic poem about childhood summers. This poem focused on memories with their father, which is appropriate this year since Father's Day lands on Midsummer as well! No, seriously, I really do. ... I took a pair of scissors and gave any member who wanted it several stalks to take home. It didn't even make a dent! 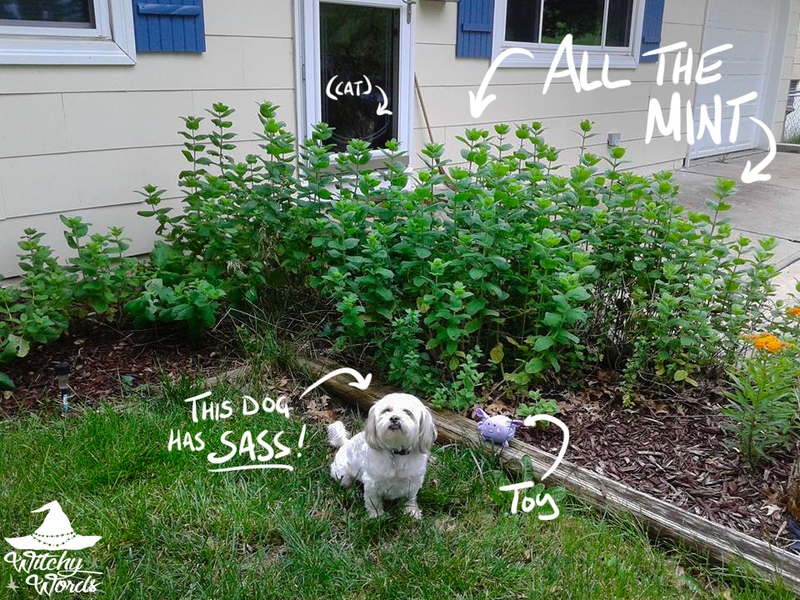 I'm pretty proud of this considering that I didn't get around to gardening this year. Somehow, something always finds a way to grow around me! And that concludes the Circle of Fountains Midsummer ritual and celebration for 2015! From my circle to yours, have a fantastic Litha! 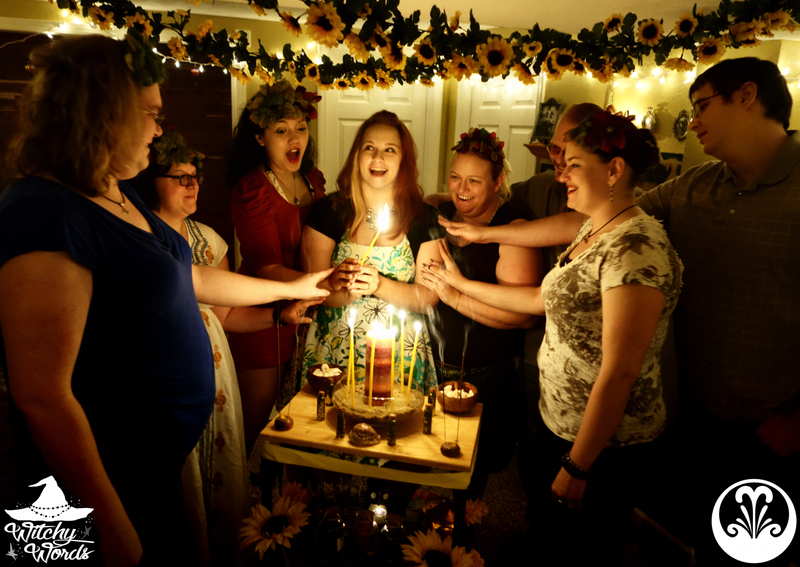 To see the previous sabbat, May Day / Beltane, click here!